Retailers have become the relationship power brokers in the retail supply chain. KANE wanted to understand how CPG companies, particularly small to mid-sized businesses (SMBs), could reduce product distribution costs while coping with the supply chain demands of major retailers. So we collaborated with Auburn University to survey 110 logistics executives at consumer product companies. Interviewees indicated that, given the opportunity, they would benefit from working more closely with major retailers to reduce product distribution costs. That said, the majority of mid-sized CPG manufacturers struggle in this area. Relative to large CPG manufacturers, mid-sized companies do not have frequent, extensive communication with retailers. Retailers tend to focus on the suppliers that provide the largest proportion of their products and tend to drive their revenues. Mid-sized CPG companies report they struggle to convince the retailer to invest energy in the partnership with organizations of their size. Interviewees highlighted the challenges created by retailers holding much less inventory and demanding access to rapid replenishments of small lots. This forces the CPG manufacturer to either sacrifice efficiency or rethink their inventory fulfillment processes. Representative comment: “The retailers are killing us – constantly changing delivery and inventory demands and then imposing punitive actions for non-compliance." CPG manufacturers need to reduce product distribution costs, but they are concerned with the retailers’ move toward lean inventories. Mid-sized companies are disproportionately affected by this retailer requirement with nearly 50 percent citing this concern. In comparison, 34 percent of large CPG companies highlighted retailers’ unwillingness to hold inventory as their primary challenge. Transportation is the linchpin to CPG-retailer supply chain success. Poor compliance with retailers’ transportation needs will cause fulfillment problems and jeopardize customer goodwill. Hence, freight transportation excellence is paramount to maintaining strong relationships. The interviewees appreciate the retailers’ desire for perfect deliveries and continuous flows but argue that a reduction of overall supply chain network efficiency is a major consequence of smaller, more frequent deliveries. CPG manufacturers cited problems with retailer receiving dock backups, unrealistic lead times, and the growing delivery cost burden for manufacturers. Interviewees noted that 3PL partners can provide an important advisory role and ad hoc project team capabilities that mid-sized manufacturers cannot create internally. This paves the way for a three-way relationship between the manufacturer, its 3PL partner, and retailers to collaborate to reduce product distribution costs. Retailers have become more cautious and demanding of suppliers in recent years and larger CPG competitors have the upper hand over SMBs in terms of collaboration and process alignment. However, these mid-sized companies are not waving the white flag. They are making strategic investments in technology, partnering with 3PL providers, and modifying fulfillment processes in a push to level the playing field. 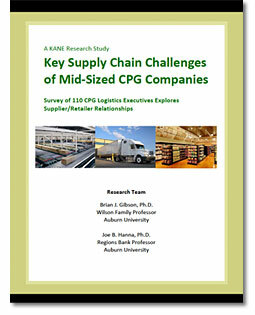 To learn more, read our Viewpoint paper: "Key Supply Chain Challenges of Mid-Sized CPG Companies."